You can define your own planning functions of the type Exit Function to perform specific planning tasks that you cannot solve with any off the planning functions offered by SAP BW-BPS. You will need to provide function modules to modify the transaction data. 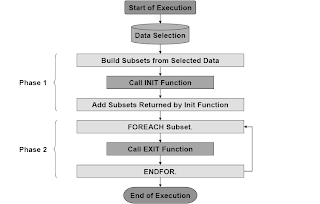 Exit functions offer you extensive control over every detail for calculating plan data, however they also require the most work as you must write your own ABAP programs. 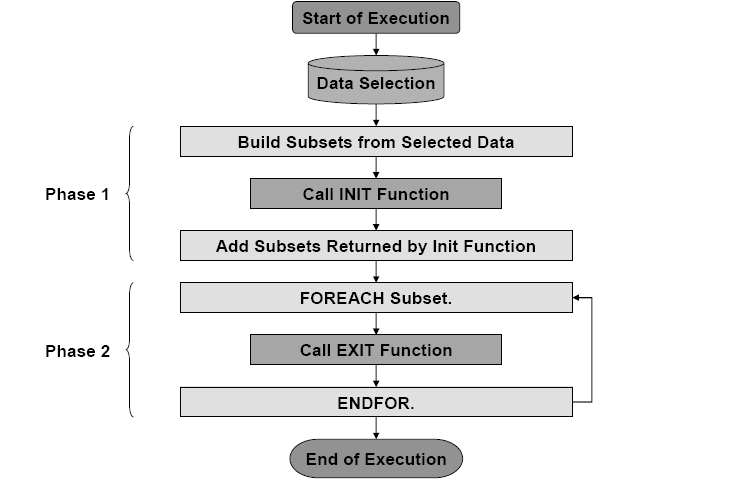 When an exit function is executed, the system retrieves the data defined by the planning package. The data is read either from the InfoCube or from the buffer, but the developer does not have to worry about this. In the first phase, the system builds subsets out of the selected data. How the subsets are built depends on the "fields to be changed" setting in the definition of the exit function. How many subsets are created depends on the "fields to be changed" and the selected data. Note: Subsets will be created only for existing data! Now the system calls the INIT function. Preliminary work like reading reference data or selecting from a database table should be here. Optionally, you can return additional subsets. This way you can make sure that the main EXIT function is called for a subset.In the second phase, the main EXIT function is called once for each subset. This is very similar to a single FOREACH statement (not several nested FOREACH!) that includes all characteristics that are not in the "fields to be changed" (but remain in the "field list").